Well, we weren’t going to get through the month of October without mentioning Tim Burton. That’d just be silly. 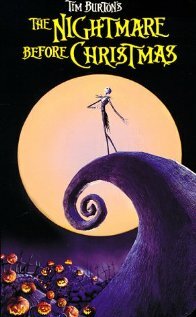 The Nightmare Before Christmas is such a great movie y’all, but I don’t need to tell you that. I’m sure you’ve seen it dozens of times. This may very well be Tim Burton’s masterpiece. The claymation is just astonishing, the music is lovely, Danny Elfman‘s finest really, and the story so touching. I mean, it is essentially about a skeleton having an existential crisis, how crazy is that? Who hasn’t had an existential crisis?! I have one every other day. Anyways. This is such a charming film, all of the crazy inhabitants of Halloween Town provide just the most astonishing, creepy, unforgettable visuals. I love the two-faced Mayor (political commentary!) and the vampires with their sunglasses. And Christmas Town is just as fascinating, with all the colors and the little elves. And, of course, we cannot forget Lock, Shock and Barrel’s singing the kidnap the Sandy Claws song. And if you really want fun times, check out KoRn’s version (you don’t really have to, but I’m giving you the option). So the plot is basically, Jack the Pumpkin King, the best scarer of Halloween Town, has an existential crisis, accidentally stumbles into Christmas Town, and decides to Halloween-ify Christmas. Of course at the end he realizes that Christmas is great and Halloween is better, so he leaves well enough alone. There is also a side-plot involving a rag doll named Sally and her scary “master” who can scratch his own brain, ick. Anyways, this is a Halloween (and Christmas!) staple and if you haven’t seen it then you are a silly person and should remedy it right now. Also, I realize that my Thrilling Thursdays mostly stuck to childhood staples. Any favorite Halloween movies that I might have missed? I’m not big into scary movies, but if there are any must-sees you should let me know. I can probably stomach it! Glad to know I’m not the only one digging on Kidnap the Sandy Claws. For some reason, this movie is the only thing about Halloween my Hubby truly loves. He randomly starts singing while unloading the dishwasher “I am the one hiding under your stairs…” Pretty cute. Sounds like you should edge into the scary movies. Did you ever see Stephen King’s Cat’s Eye? That might work for you. Not really Scary scary, has Drew Barrymore and James Woods (yea, smart boy!) and a cat that is in every vignette.